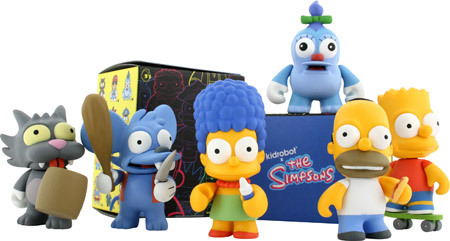 If youâ€™re at all in tune with whatâ€™s been going on in this â€œworldâ€, youâ€™ll know the name Kidrobot. Or hey, maybe youâ€™ve been sitting under a rock, which we can guarantee is not made of plastic nor does it have a cute little face. It is time to go and get yourself a rock, paint on a face and call it George. Better yet, get online and pick up one of Paul Budnitzâ€™s DIY MUNNY, just one of the many playful products from his worldwide phenomenon of a brand, Kidrobot. Paul Budnitz is an artist that is making the world a better place one little smoking rabbit at a time. Format: You are the president and founder of Kidrobot. How has your role changed since its inception in 2002? Paul Budnitz: When I started this company I was literally doing everything — besides creating toys with Tristan and much of the artwork, I also programmed all the computers that ran our business. I have a technical background (as well as art) and I was able to make the computers do a lot of the work that I couldnâ€™t have done on my own, and with my small staff. And then there was running the business too. At this point my role is mostly creative, designing and art directing our products, guiding the brand and the business. Iâ€™m not writing code any more, and thatâ€™s a giant relief, because we can pay someone who is actually better than me to do that. And in another way, nothing has changed. Kidrobot is an integrated system, and Iâ€™m deeply involved in all aspects of this company. Kidrobot has a very specific vision, for our artwork, and also for our culture, both within the company and how we present ourselves to the world. Format: â€œWhat would I wear if I was a toy?â€ Please explain the concept behind your apparel line. 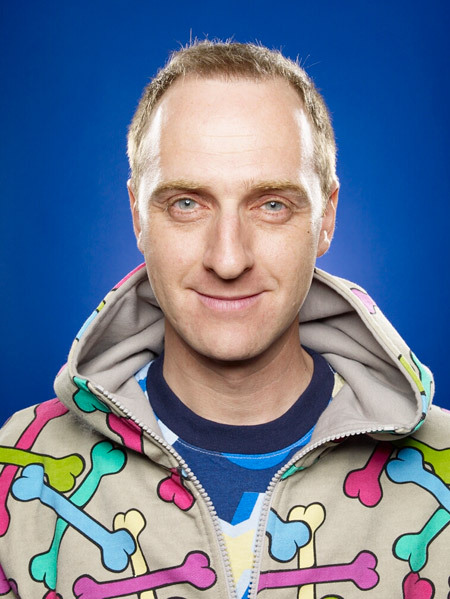 Paul Budnitz: When I decided that Kidrobot would go into apparel a few years ago, it was partly selfish, because Chad (who does a lot of the creative with me) and I love fashion. And mostly because it just felt natural. It is just an extension of our whole aesthetic. The Fall 2008 clothing line was based on the question, â€œWhat would you wear if you were climbing Mount Everest in 1982 listening to Kraftwerk, and you were a Kidrobot toy?â€ So this fall there are lots of fleece jackets, sweatshirt cuts that are based on outwear, and at the same time, everything is bright and colorful and a little absurd. Lots of purple, and the lines are very clean and very poppy, and thatâ€™s the Kraftwerk part. You can tell our clothing a mile off. Itâ€™s us, nobody does what we do, and Iâ€™m glad about that. Format: You studied photography, sculpture and film at Yale University earning you an honors degree in Art. How did your education play into the success of Kidrobot today? Paul Budnitz: It didnâ€™t. As far as Iâ€™m concerned, traditional education is crap, and it took me ten years, most of my twenties, to undo the damage that Iâ€™d done to myself by listening to people who thought they knew how reality works. Inspiration is instinctual, you canâ€™t analyze it and you canâ€™t create it by going to classes. There are things that you can do to encourage the creative flow. None of them have anything to do with going to class. Learning to show up, reliably, to be accountable for what you promise to do (which is the most important quality you need creating and running your own business) is something you can learn from a mentor, or develop through discipline. The things that you can learn from classes are technology, and I donâ€™t mean just computers, but technology in the sense of business systems, organizational systems, etc. So that may be useful for some people, and for me, I learned what I needed to learn when it was necessary, and try not to fill my head with unnecessary garbage. My experience is that school is generally a waste of time, unless you enjoy it, or youâ€™re a rare person that really can make use of it. Going to Yale had one great advantage, which is that when I moved to New York and was totally broke it helped me get apartments, because landlords would say, â€œWow, this guyâ€™s gotta be responsible and rich, because he went to an Ivy League schoolâ€. Little did they suspect, ahahaha. Format: You have an extensive yet untraditional background in the fashion industry. Please tell us about it. Paul Budnitz: My friend Shawn and I started a company called BIG, where we bought & sold vintage clothing. Weâ€™d show up at flea markets all over California at 5:00 AM, and got to know all the people that picked antiques, vintage, and clothing from all over the states. Weâ€™d buy the jeans, mostly, and horsehide jackets, old Air Jordans. The really nice stuff would go to Japan, and I once sold a pair of 1940â€™s era Leviâ€™s jeans that were made for a circus stilt walker — they had legs that were about 20 feet long and a size 50 waist – to a Japanese collector for $35,000. Air Jordan sneakers from 1985 could go for as much as $3K. We would re-cut the more worn out stuff, and resell it with patches, stitching, etc. I actually used the money we made from this business to start my next business, Mindisico, and then I sold that business to start Kidrobot. Format: Tell us about your collaborations with Heatherette, Lemar and Dauley, and Marc Jacobs. Paul Budnitz: Well, with Marc Jacobs we made a toy called Skullhead. The toy was actually designed by Huck Gee, who was managing our SF store at the time and has since gone on to become a pretty famous artist. Marc Jacobs designed the clothing for the toy from their spring line, and the toy had a t-shirt that read, â€œMarc Jackassâ€. Marc Jacobs was also part of the toy series we did with Visionaire, that also included toys designed by Gucci, Comme des Garcons, Karl Lagerfeld, Hedi Slimane, Helmut Lang, etc. Richie Rich and Amy (from Heatherette) ended up meeting and we produced a whole series of toys with them a few years ago. They are totally fantastic, some of my favorite people. They put on amazing fashion shows! Weâ€™ve also worked with Burton, LaCoste, Mishka, and others on our clothing line. Lemar and Dauley are totally geniuses and they did some patterns for our first seasonâ€™s clothing. I used some of those same patterns as wallpaper in a couple of our stores. Format: What are some major fashion houses that have wanted to collaborate and youâ€™ve turned down and why? Paul Budnitz: I donâ€™t like to name names, itâ€™s generally because people are not reliable, or theyâ€™re assholes. If someone isnâ€™t going to be responsible, or they are just not nice people, Iâ€™m not interested. And, itâ€™s a brand thing. The brand has to say something distinct, and it has to have been well managed. If someone has trashed their own brand by creating crap product, we wonâ€™t work with them because it wouldn’t serve us. Iâ€™m still dying to work with Ralph Lauren, and I realize that might be surprising, but I think heâ€™s a super genius and I love the fantasy of the Polo brand — itâ€™s like the Disneyland of fashion. Format: â€œIs it art or a toy?â€ A question that nags you. Selling and collecting are also a part of the art. How challenging was it to get all this into peopleâ€™s psyches? Paul Budnitz: In the beginning people would walk into our store and just not get it. I remember one woman walked in, and this was early on. She was dressed very expensively, and she asked, â€œWhat are these toys from?â€ I was working behind the counter at the time, and I said, â€œThey arenâ€™t from anything,â€ and she said, â€œOK, but what are they from, what TV show or movie or what?â€ and just got more and more upset that she couldnâ€™t understand that the toys we were making were just toys. Nothing more, nothing added. So yeah, it was tough starting. You can imagine how hard it was for me to borrow money or find investors. â€œI am starting a company to sell plastic toys made in limited edition, and designed by graffiti artists, to adults.â€ That went over great with banks and venture capitalists, you can imagine. Format: What was the fashion collaboration or design that youâ€™ve loved most and why? Paul Budnitz: Well Huck Gee (already mentioned him) is a master of the custom, along with Sket. And there are many, many others. Tara McPherson, Mist, and Tilt have done amazing giant 4â€™ Dunnys — Stueban Crystal did a crystal Dunny we sold for $25K. Format: Youâ€™ve been quoted as saying â€œMUNNY is going to take over the world and change peopleâ€™s brains from passive television-watching consumers to fearless artists.â€ How close are you to achieving this? Paul Budnitz: Well, as far as I am concerned, most human beings are machines that are completely run by their emotions. Itâ€™s all about, â€œWhat can I have next that will make me feel good? I want, I want, I want.â€ And so we suffer, and we make each other suffer. We are all animals, and we donâ€™t know it. It seems like this isnâ€™t going to change anytime soon, so I figure Iâ€™ve a long way to go. I keep holding out the candle anyway. Format: You have a signed early set of 400% Devilrobots Tofu Kubricks and Evirob. Name a toy that you donâ€™t own but youâ€™d love to get your hands on? Paul Budnitz: I donâ€™t have any of Michael Lauâ€™s early handmade 12â€ toys. Iâ€™d love one of those, and as far as I know, he doesnâ€™t sell them! They are all one of a kind. Format: What is your favorite piece of apparel from the Kidrobot collection? What is the bestseller to date? Paul Budnitz: There is a black and white nylon jacket covered with Kidrobot eyes and lined with fleece that is coming out this winter that totally kills. Everything that we make is limited edition, and most pieces sell out, so itâ€™s hard to say what the bestseller is. Format: You own 80 pairs of size 13 sneakers. Would you call yourself a sneakerhead? Which is your most coveted pair? Paul Budnitz: Iâ€™m not a sneakerhead because I donâ€™t collect the shoes. I just like sneaker design, and I end up wearing them for a while, and then when I am done I leave them outside on the street in Soho and the homeless guys in the neighborhood take them. Itâ€™s great because there are all these guys pushing carts that know me, walking around in Nike Quickstrike sneakers. Itâ€™s not about coveting them; itâ€™s about keeping the energy moving. If I donâ€™t wear a shoe for a while I give it away. Iâ€™m the same way with toys and clothing and just about everything else I own. Format: Your line is available in Barneys New York. How challenging (or easy) was it to sell to these retailers? Paul Budnitz: It was easy. We showed them the line and they bought it. Very lucky. Format: Where is the future of Kidrobot headed? Paul Budnitz: Animation, music, killer clothing, and lots and lots of toys. very hot…..Im feeling his concepts. I USED TO WORK AT KIDROBOT.